Hey all you fashionista, socialite, A-list, people watching, adrenaline junkies out there…the day you’ve all been waiting for is finally here! Mark your calendars for the 30th Annual Opening Day of Polo on Sunday, June 5th, 2016! You may be wondering, but what’s so amazing about Opening Day of Polo? Well, I’m here to tell you, it’s by far one of San Diego’s most attended, fashionable and captivating extravaganzas of the summer! With over 4000 spectators in attendance, the Player’s Lounge styled by Modern Luxury and VIP tent will be swarming with beautiful people including jet setters and some of San Diego’s most elite socialites, dashing hipsters and celebrities. There’s always a soul-buzzing vibe created by the horses charging down the field, the solid click of mallets on the ball and the clinking of champagne glasses and divot stomping at half time (yes, that’s right, just like Julia Roberts did in “Pretty Woman”). Of course, there’s plenty of food and libations for glamorous guest to enjoy while they’re busy socializing and taking selfies. If laid back is more your style, join friends in the general admission area with picnic tables, craft cocktails and giant jenga! 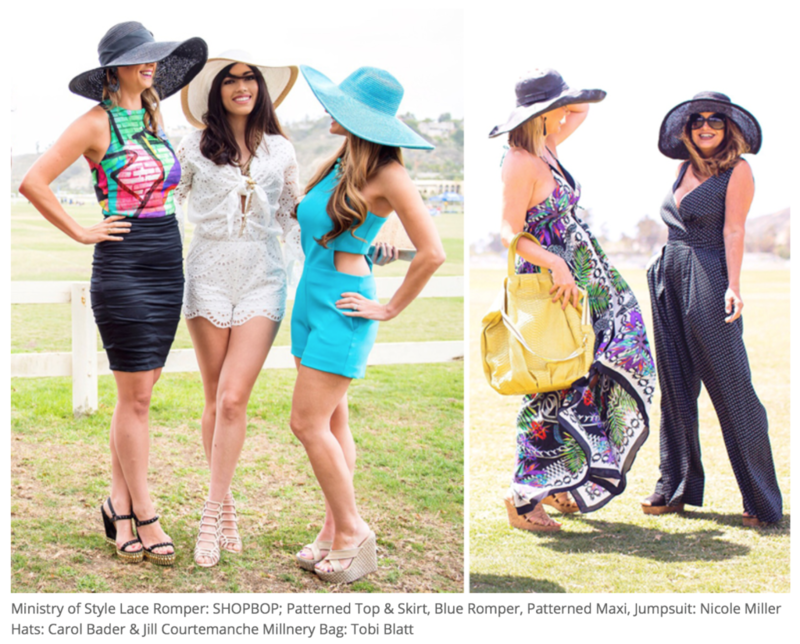 No matter where you sit, Opening Day of Polo has something for everyone. It’s a place where new friends meet and old friends and family reconnect and celebrate. 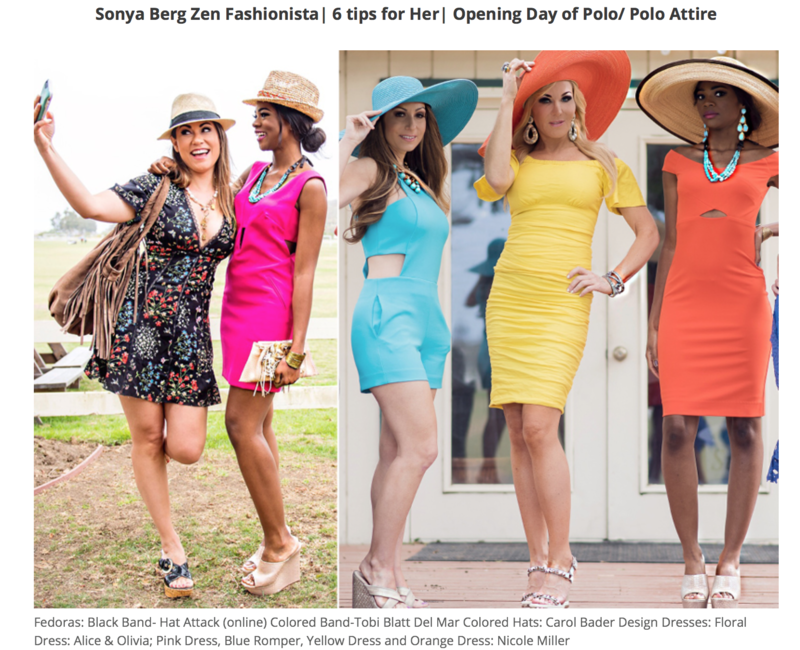 Now, how are we going to get you looking chic and on point for Opening Day of Polo? Let’s start with the basics…. Wide brimmed straw hats and fedoras! 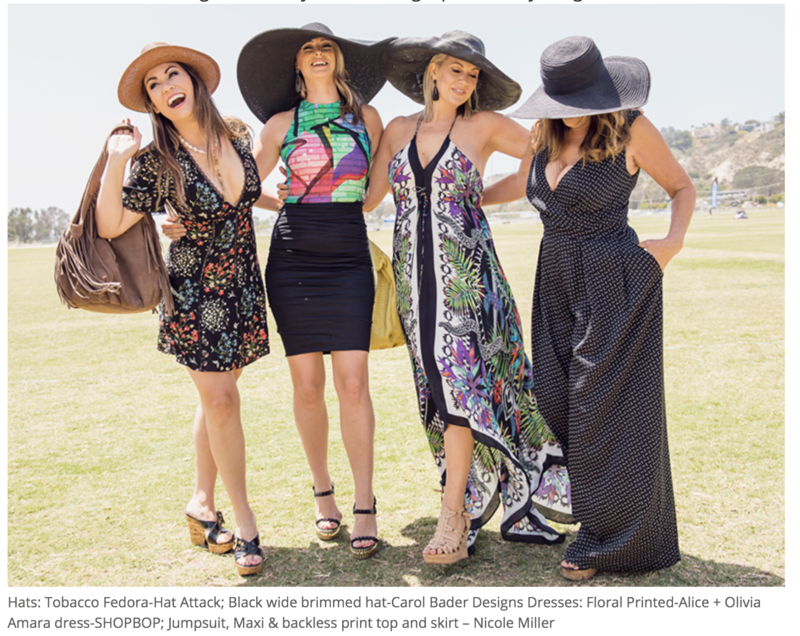 Opening Day of Polo tends to be a bit more relaxed in style than Opening Day at the Races. Hats help to provide protection from the sun and add a more polished look to your attire. For a sophisticated and classic polo style, stick with unembellished and simple less structured wide brimmed straw hats and fedora. 2. 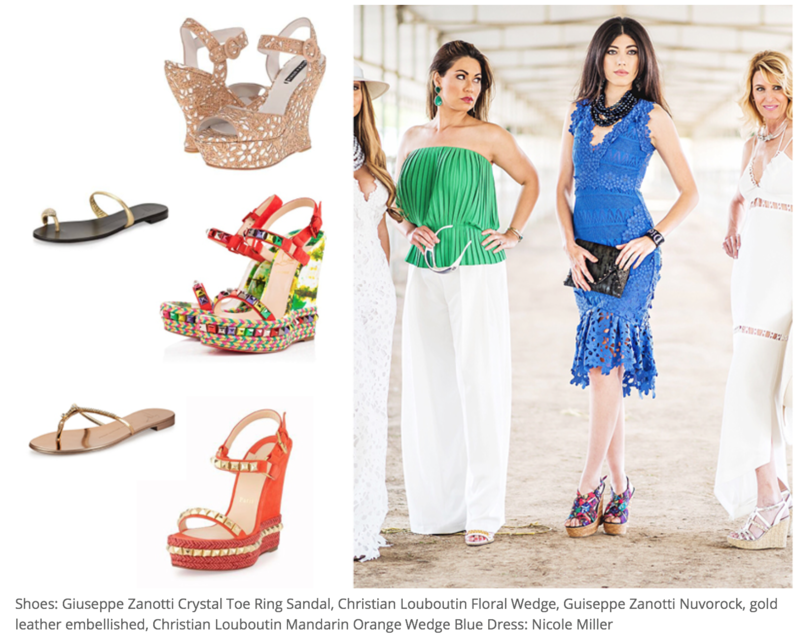 Wedges, espadrilles, chunky heels or flat sandals. Remember ladies; half time divot stomping is a polo tradition and a ton of fun to boot! If you don’t want to turn you champagne sipping, selfie taking, divot stomping escapade into a perilous experience…then wear wedges or flat sandals and leave those stilettos at home! 3. Stay on trend: dresses, skirts, jumpsuits, palazzo pants and rompers. 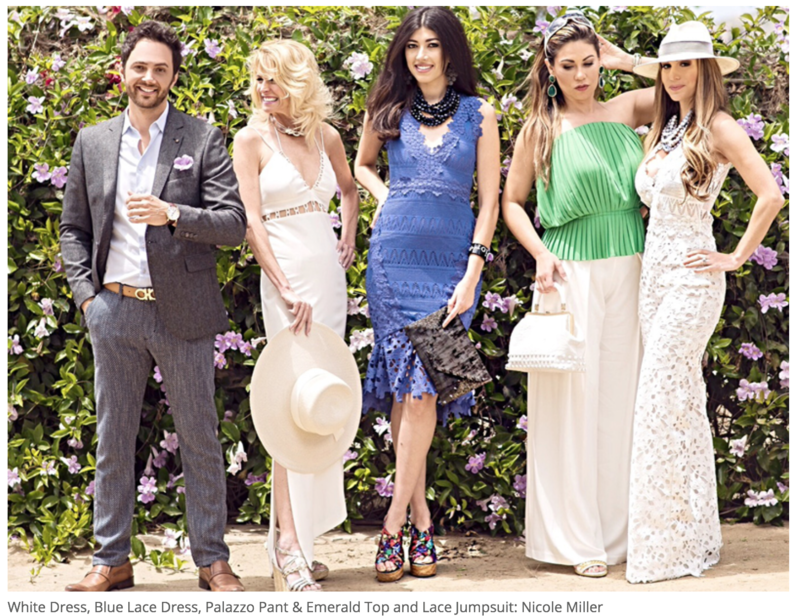 Ladies remember if your watching polo from the Player’s Lounge styled by Modern Luxury or the VIP tent, dress in refined and classy styles.This Nicole Miller lace jumpsuit is the perfect VIP fresh and feminine silhouette. Micro pleats were all the rage on the spring 2016 NY fashion week runway. Look in vogue while keeping your cool wearing flowing styles like this ivory pallazo pant combined with a green micro pleat strapless top. 4. Lighten it up with various shades of white, or go bold with bright colors, prints or patterns! Monochromatic ensembles in shades of crisp white and crème look sophisticated and elegant for polo and they keep you cool in the sunlight. If you want to look in vogue in monochromatic hues then choose one of spring and summers current fashions like this trendy, powder white eyelet romper; notice the statement bell sleeves! Both of these other looks are perfect for Opening Day and very fashionable. Keep it classy with a touch of sass, this pearl white lace jumpsuit with plunging neckline is a must! Looking for a romantic twist? Try this romantic eggshell lace dress with a beautiful open back.Go bold or go home! Opening Day of Polo is the day to sport those vibrant, jewel toned colors that look great when you’re striking a pose with your girlfriends. Feeling flirty? Try a playful patterns, which are a fun alternative to solid colored attire. If Boho Chic is your style, this whimsical floral print dress is flowy and looks hip with a trend setting suede fringe hobo bag and a fedora. Other prints to try for your Opening Day of polo look are oversized bright graphic prints, colorful tropical prints and polka dots. 5. Wear lightweight fabrics like cotton, silk and linen that are breathable. Your choice of fabric is just as important as the color, shape, style and accessories of your summertime polo viewing outfit. You want to stay cool while looking chic and protecting your skin from too much direct sunlight.Organic or natural fibers absorb moisture from the skin and allow it to evaporate. In contrast, synthetic fibers are water repellent, which results in evaporation reduction, unsightly perspiration rings, discomfort and irritation. Cotton, linen, silk and even rayon are all excellent choices because they’re lightweight and breathable fabrics and help to keep you cool. For additional comfort on a hot sunny day at Opening Day of Polo choose a summer outfit with cut outs or a large open weave, like eyelet or lace. Flared skirts; billowy dresses, skirts and pants; halter dresses; strapless dresses and other sleeveless options are other styles that will keep you cool while looking fashion forward. 6. Don’t forget to accessorize with trendy sunglasses, playful color coordinating accessories, a wrap, stylish hair, manicured nails and pared down radiant makeup. We talked about hats and shoes, but there’s so much more to play with. Want to create instant movie star mystery, intrigue and glamour? Start by donning a pair of trendy oversized, mirrored lenses or embellished sunglasses and voila! Add a chic chunky collar necklace with streamlined leather straps and crafted from shimmering resin beads; they’re versatile enough to go from day to night and casual to dressy. It could get a little chilly at dusk so don’t forget to bring a pretty summer wrap, shawl, sweater or jacket, in a complementary print or monochromatic color, to throw over your shoulders when the sun is setting and your dancing the night away at the 7th Chukker After Party! And last, but definitely not least, make sure your hair, nails and make-up leaves you feeling fresh and beautiful out in the sun on Opening Day! Beautiful fresh skin and minimalist makeup with a natural luminous base is trending for summer. 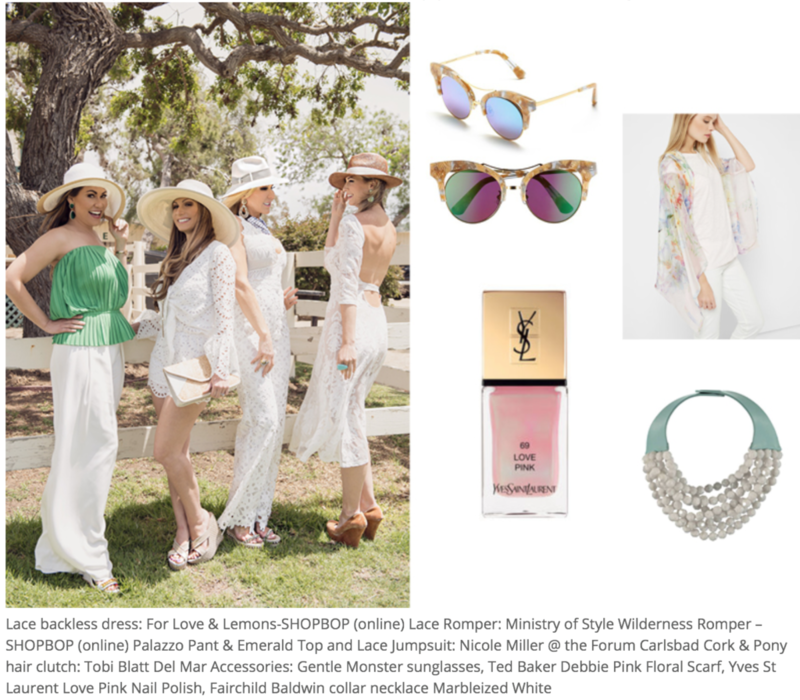 Now that all of your stunning polo viewing sirens have the look down, go throw on your Louboutins and flaunt your beautiful self at Opening Day of Polo on June 5th! 6 Steps To Creating A Magnetic Vision Board That Works!